When it comes to decorating a home, many factors go into creating the ideal place. For many people, the goal is to take any space and make it come to life. They’re looking for a decor plan that is at once classic, elegant and yet entirely simple. One of the easiest ways to keep it simple and yet beautiful and full of interesting detail at the same time is with the use of the right kind of rugs. The use of rugs offers tremendous appeal for all those who love and adore such style. A Moroccan Berber rug fits the bill in every possible way. These rugs make a wonderful thing to bring to any room in your home and set the stage for everything else. Anyone who wants to turn a room from ordinary to something remarkably special can look to the Beni Ourain rug to serve as the basis for the rest of their plans for the home. Any plan to decorate a room works best when reduced to a few great pieces made of the finest materials. This is where the Berber rug comes in. It easily serves as the centerpiece and focal point for all that’s to follow. Place in on the floor and watch the entire space come alive with much needed texture, welcome softness and elegance. This rug is ideal for those who are looking for a few fantastic items they can use in any room room in the home to marvelous effect. 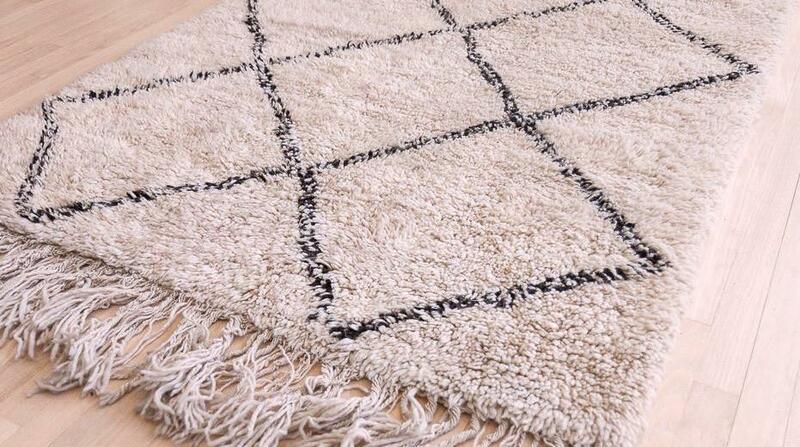 Those who made the Moroccan Berber rug begin with a few simple materials and keep to them. They turn to the sheep that they know so well in the Atlas mountains for help. These sheep are closely tended to make sure they produce a highly superior product. Over time, tribe members have learned how to make sure the sheep have what they need to create an incredible base for all Beni Ourain rugs they take such pride in making. They make sure that each sheep can grow lovely wool. Once the wool is harvested to make the rugs, it’s one of only a handful of materials used to make the final finished product for homes around the world.